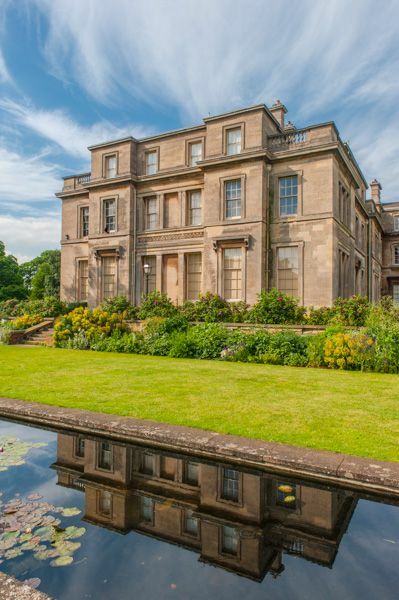 Normanby Hall is a Regency mansion built by Sir Robert Sheffield in 1825, standing in the heart of a country park just north of Scunthorpe, Lincolnshire. In the park are a walled Victorian garden and lovely countryside walks. 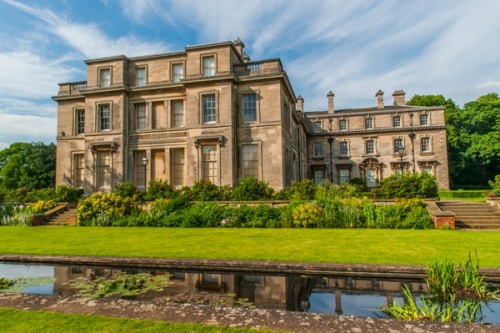 In 1825 the Sheffield family called in architect Robert Smirke to design a mansion house in their country estate just north of Scunthorpe. Normanby was never the family's main residence; they lived here only 5 months each year, inviting guests to enjoy winter entertainment such as pheasant shooting, and offering hospitality over the Christmas season. They would move to London for the 'Season' in spring, then spend another week at Normanby on their way to spend the summer at a shooting lodge in Scotland. No matter which residence the family happened to be staying at, fresh fruit from the gardens at Normanby was sent to them. In return, the family sent hampers of dirty laundry back to Normanby for washing! The house was converted for use as an Army convalescent hospital during WWI. Rather than move out to make room for the hospital, the Sheffield family and their servants remained to help take care of the wounded soldiers. The story of 'Normanby at War' is told in a series of very moving displays on the first floor of the house. 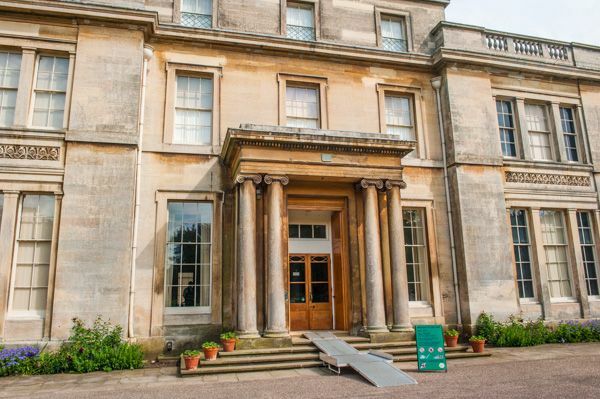 Since 1964 the Hall and the surrounding estate has been cared for by the local council on a long-term lease. The exterior of the house is what Simon Jenkins, author of England's Thousand Best Houses, calls 'severe'. I call it understated elegance, in a style that would have been very fashionable in the early 19th century. If the outside is understated, the inside is a glorious explosion of grandeur. 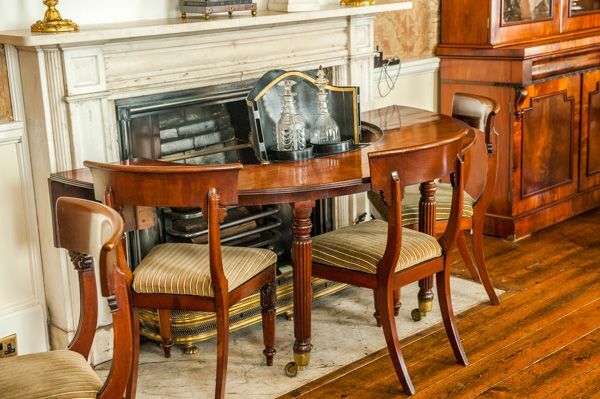 The state rooms have been restored to how they would have looked in the late Regency period, using household inventories from the 1829-1840 period. The result is fantastic; the interiors of Normanby are simply wonderful; an eclectic mix of sumptuous architecture and more homely family artefacts. The entrance hall is vast, with a classical screen protecting a drawing room centred around a large fireplace. There are two drawing rooms at ground floor level, the East and West Silk Drawing Rooms, named for their wall coverings. Fine furniture is scattered throughout, with portraits of Sheffields covering generations. 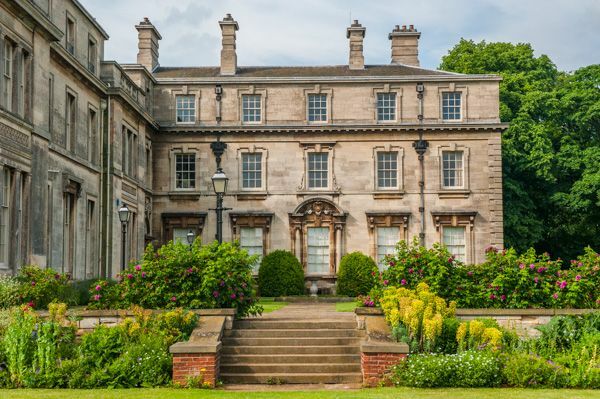 The Normanby Estate covers 300 acres of park, woodland, and gardens, and is operated by the North Lincolnshire Council and open every day of the year. 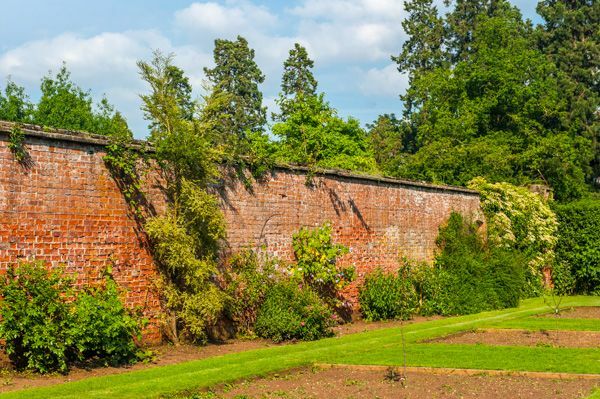 Close to the Hall is a Victorian Walled Garden, and further afield is a deer park, fishing lake, and a special Servant's Trail, giving a glimpse at the life of the multitude of servants and estate workers who helped keep the estate running. See where bread was baked and ice made and preserved. See the laundry, horse and dog quarters, and where the estate's own fire engine was kept. The trail follows the routes used by servants around the estate, many of which were located so the workers were out of sight from the Hall. Within the grounds - a short walk from the Hall - is a popular Farming Museum, with traditional agricultural tools and machinery. See a recreated farm labourer's kitchen, a blacksmith's shop and a saddler's workshop. Displays tell the story of how the land at Normanby was worked from 1850-1950. The Walled Garden has a restored bothy, a head gardener's office, potting shed, and glasshouse. Victorian varieties of fruit, flowers, and vegetables are grown using traditional tools and techniques, just as they would have been in Victorian times. In the glasshouse are more tender species like grapes, peaches, and exotic plants. There is a Vinery for grapes and a subtropical bedding display during the summer months. The Fern House displays orchids and ferns, while the Display House showcases rare and exotic ornamentals from around the world.